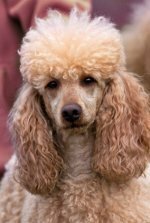 With our poodle dog store online you can find the perfect gift for the poodle lover in your family or your poodle loving friend. Most people have at least one poodle fan in their household. We give you ideas for stocking stuffers or that special extra gift for a birthday, anniversary, graduation or holiday present. Tee shirts are nice to wear with jeans when you walk your pooch around the block or take her to the doggie park. Everyone has keys! The keychains make a nice extra little gift any time of the year. Do you do a gift exchange at work or amongst your family and friends? Give them one of the keychains! The totes are great for whatever you carry around with you every day! Heading to the gym? Pack your water bottle and sneakers in the bag. Heading to the park? Put some doggie treats and a good book in, and you and your pet are set for a few hours of outdoor fun! The buttons are another cute "just because" gift, stocking stuffer or exchange present. They come in a variety of shapes and colors - a perfect gift your poodle lover will adore! Pick up a mousepad and have your pet with you all day at work! 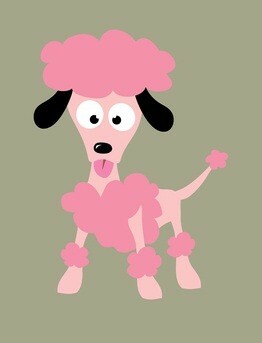 Or maybe you want poodle shirts, mugs, calendars or mousepads for yourself. We have some really cute mousepads that would be great for your office. You'll also find cartoon poodles drawings on a lot of items. They are too cute! You can go to the main gifts page to find a large selection of items. We only have a sampling on our website of the many fine items available on the main store page. We make a small commission off of each purchase which helps us maintain our website. Thank you for your patronage!